I’ve played soccer most of my life and always viewed running as a means to an end (i.e. warm up, as part of the game, etc.) and not something to do for fun. 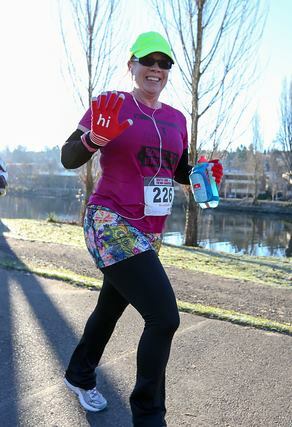 In 2013 a friend suggested that we run the Tacoma City Turkey Trot and I thought…“Why not?” While I was unable to run the entire time, I had so much fun that the next day I signed up for the Santa Runs Tacoma 5K. When 2014 started I set a New Year’s resolution to run a 5K a month with the hopes of being able to run the entire race. For the year I ended up running 16 5Ks, a 3.5 mile obstacle mud run, 2 10Ks, and my first half marathon! Needless to say I’m addicted and can’t wait to share my love of running with others! If you've shopped in our store these two should look VERY familiar. Jesse and Michelle are two awesome Fleet Feet FIT Specialists and now coaches for your Summer Run Camp. They will take you on an 8 week hike to improve YOUR personal best. Elizabeth Hansen, No Boundaries 5k, "It’s no use going back to yesterday, because I was a different person then." Kriss Schatza, Half Marathon, "The miracle isn't that I finished, it's that I had the courage to start"
Zach Zimmerman, Half Marathon, "I used to think that I would never run a half marathon. Well that eventually happened. Then I said I would never run a marathon. Well eventually that happened. My advice to you is, "enjoy the journey." It will hurt at times, and be hard. But it is an awesome experience." Are you looking to joint the Fleet Feet Family's Coaching and Mentoring Crew? E-mail Angela at Angela@fleetfeettacoma.com. Please include why you think you would make a great coach or mentor for the Fleet Feet Tacoma Crew! Program Start: Have you ever thought your running a 5k? What about a Half or Full Marathon? Description: You CAN do it! Whether it's your first 5k or half-marathon, we have the training group for you! Join our Fleet Feet Family! Promise you won't regret it!